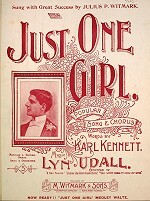 From 1899, a sweet song of love and devotion, Just One Girl, sung by J. W. Myers. Announcement "Just One Girl, sung by J. W. Myers for the Columbia Phonograph Company of New York and Paris." Enjoy this classic song of love sung by the great baritone J. W. Myers. Typical of the period, this recording carries the brash sound of a copy produced by pantograph from a loud 5" diameter master. See the May 2002 Cylinder of Month for another selection sung by Myers.